The Googins took their 13-month-old son Kellen to Children's National Medical Center for a relatively minor procedure. But it became more complicated when he went into cardiac arrest after receiving anesthesia. Today, Kellen is nearly 3 years old and is doing well. His parents attribute his health -- and the promise of a healthy future -- to anesthesiologist Dr. Zena Quezado, principal investigator of the Pain Medicine Initiative at the Sheikh Zayed Institute for Pediatric Surgical Innovation. A medical team performed CPR for 19 minutes and shocked him seven times, until his heart rhythm returned to normal. Kellen's mother Michelle says, "I truly believe that he's here today because of Zena....I feel like it was her mission to make sure that he lived. You'll never be able to convince me otherwise." Read Kellen's dramatic story from The Washington Post. The most recent issue of HealthLeaders Magazine highlights budget friendly strategies that children's hospitals are implementing to provide high quality surgical care in more efficient and innovative ways. 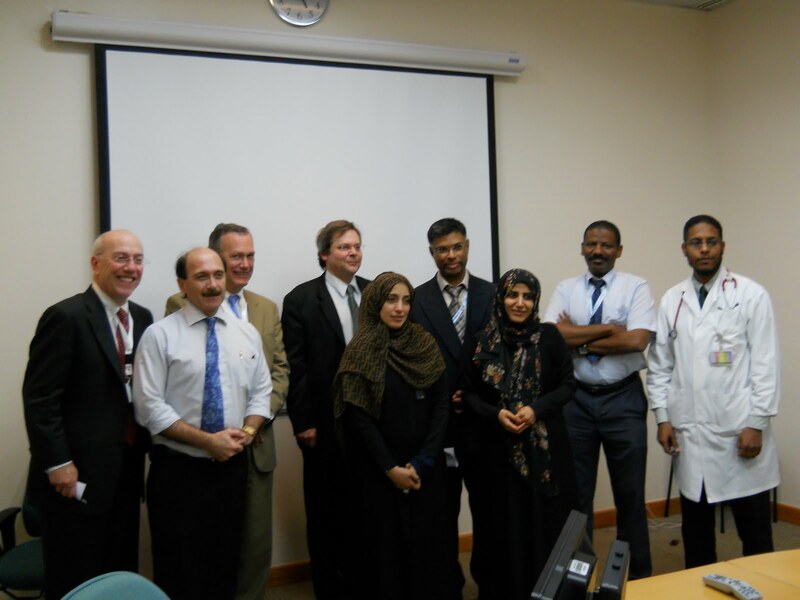 The Sheikh Zayed Institute, including Kurt Newman, MD, senior vice president of both the Institute and the Joseph E. Robert, Jr., Center for Surgical Care at Children's National, and Nabile Safdar, MD, are featured under Success Key #3: Physicians and IT working together. The section focuses on the unique integration of technology and medical expertise built by the Institute. "You see this approach in industry and business, and you see some aspects of this approach in various academic medical centers, but pulling together so many disciplines into one institution is highly unusual in academic medicine," Dr. Newman said. "You'll see more hospitals and institutions adopt our integrated team model and approach toward innovation." The story also features initiatives under way at other pediatric hospitals around the country, but with some themes quite familiar to the Sheikh Zayed Institute, including minimally invasive surgery, especially the use of robotics in pediatric procedures. 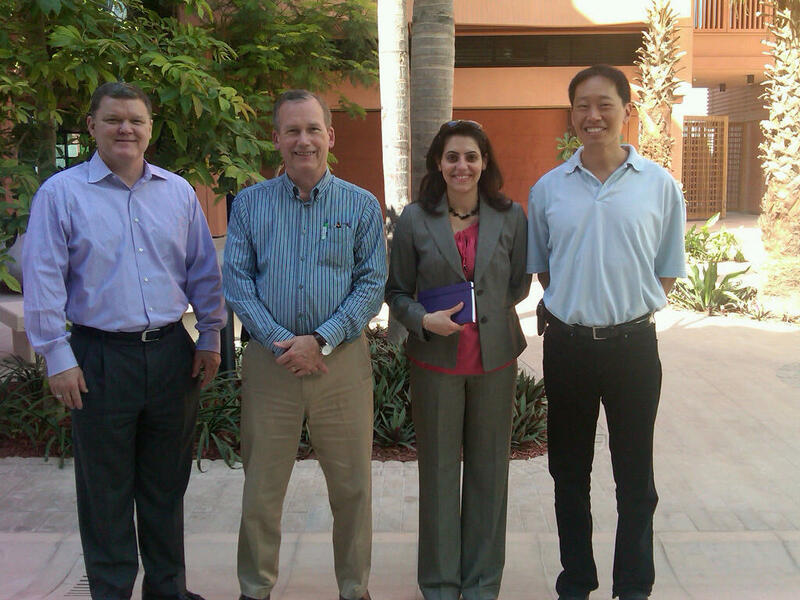 Toward the end of our trip, some of the team visited fledgling development Masdar City, located just outside Abu Dhabi. Masdar City is more than just another set of buildings popping up in the desert. When complete, Masdar will house 50,000 residents in one of the most environmentally sustainable cities in the world--an ambitious plan, especially when you consider the unique climate challenges of the region. Not only do designers have to create a sustainable city, it has to be livable even during the 6 to 8 months of the year when temperatures soar well above 100 degrees. To combat this problem, the city uses a mixture of traditional Emirati tactics to beat the heat like orienting streets in a specific way to cut down on sun and angling windows to avoid direct sunlight streaming in, and new technologies that enable more efficient living. At the heart of the plan is the Masdar Institute of Science and Technology (MIST), which opened its doors to graduate level students in 2009. The Institute is a collaboration with the Massachusetts Institute of Technology (MIT) that seeks to provide a world-class research and education environment for future leaders and critical thinkers in science and technology, with a particular focus on advanced energy and sustainability. Masdar’s unique design hopes to inspire its students to reach greater heights by making the campus environment thematic inspiration. 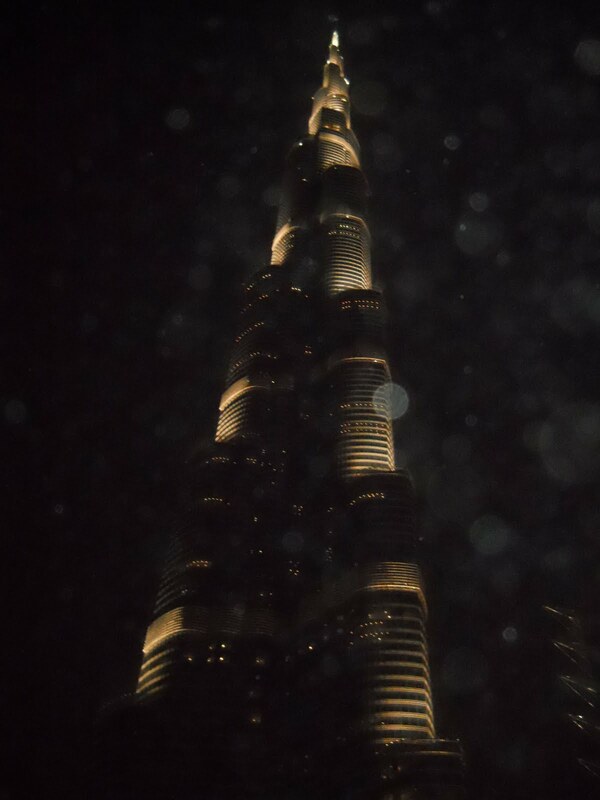 It consumes 55 percent less in cooling demand compared to UAE baselines, uses 54 percent less water, and has a 75 percent waste-heat recovery. MIST is a great example of how the research environment, including the architectural design, can act as a catalyst for greater discovery. These approaches are inspiration for the team at the Sheikh Zayed Institute, who are working to create their own state of the art research space back in Washington, DC. That space, expected to open in 2011, will encourage and initiate team science, collaborative research across the four core program areas of the Institute, and innovative thinking aided by state of the art research tools. And, as additional environmental inspiration, the location on the top floor of the main Children’s National building means that the children who will one day benefit from the research are never far from sight or mind. 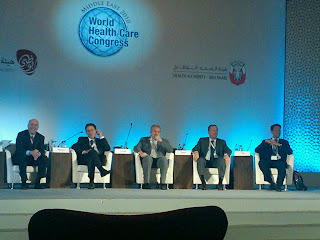 The World Health Congress Middle East concluded yesterday. Today, the team has one more hospital visit. While on site at the Congress, our doctors had the unique opportunity to spend time understanding the health care challenges that many countries face. Some themes are similar: sustainability, affordability, overall health care reform, and service delivery. Some themes are unique to individual countries, for example how governments approach the difficult task of ensuring health care reaches every corner of a large, diverse population. The spirit of open dialogue, innovation, and collaboration that was emphasized throughout the conference was clear even in the media coverage of the event. Many Middle Eastern news outlets featured the events and highlighted some of the innovative ideas presented. This included coverage of the team at the Sheikh Zayed Institute who played an active role both in the conference dialogue and in several meetings and visits with local medical professionals and hospital administrators. Here are some stories that highlight the shared goals of the conference and Children’s National. Additionally, Dr. Peters and Dr. Sze were featured in Ittihad, the primary Arabic language newspaper in Abu Dhabi (see image above). The morning kicked off with a special breakfast session featuring Craig Peters, MD, and Raymond Sze, MD. 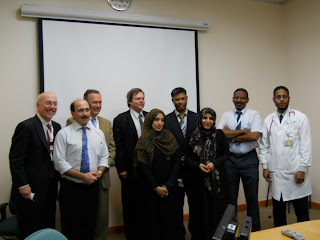 Dr. Peters, chief, Surgical Innovation, Technology, and Translation, Children’s National; principal investigator, Sheikh Zayed Institute, showed the promise of "Using Tomorrow's Surgical Technology Today," including emerging technologies like robotic surgery that have been created for adults but are well suited for use in children as well. "You have to understand the technology to truly understand the potential of robotics and where we may go with it," noted Dr. Peters (right). "This technology is in phase one of where we think it could go in terms of minimally invasive surgery applications for children in the future." Dr. Sze, chief of the Division of Diagnostic Imaging and Radiology and principal investigator at the Sheikh Zayed Institute focused on "Winning the Imaging Arms Race," including a history of where the field of medical imaging began and drawing a sharp contrast with the practices of today. "Imaging tools are growing so precise that it's not impossible to think that with time, we might able to 'drill' down to the molecular structures of the body with such clarity that we may one day diagnose a disease like cancer based on a scan, with no biopsy needed," said Dr. Sze. Both presentations emphasized that precision is a key component to pediatric surgical innovation--greater precision in both imaging and surgical procedures will lead to surgeries that are less invasive and cause less pain for children. The idea of precision also played a role in the presentation of Eric Hoffman, PhD, "Predictive, Preventive and Personalized Medicine." Dr Hoffman, principal investigator in the Sheikh Zayed Institute and the director of the Research Center for Genetic Medicine at Children’s National, discussed how understanding the precise genetic differences between patients can improve health delivery through predicting medical outcomes, preventing the onset of serious diseases by detecting problems when they remain microscopic, and tailoring treatments based on how a specific person will respond. In a nod to yesterday's theme of innovation, Children's Chief Medical Officer, Peter Holbrook, MD, outlined how Children's National constructed a unique hospital management model that has enabled innovations across all of the hospitals main priorities: care delivery, advocacy, research, and education. The day ended with a panel discussion moderated by Kurt Newman, MD, senior vice president of the Joseph E. Robert, Jr., Center for Surgical Care and the Sheikh Zayed Institute, that included: Dr. Peters, Dr. Sze, Bernard Algayres, PhD, eHealth General Manager, Europe, Middle East and Africa GE Healthcare IT, and Andrew Conrad, PhD, Scientific Officer and co-founder of LabCorp's National Genetics Institute. "Great leaps in technology can be used to improve care and outcomes," said Dr. Newman. "But, how does this translate to a new health care model?" Through the examples of more precise imaging, surgery, health care management, and genetic analysis, each member of the panel reinforced the idea that these advances will lead the way to an entirely new approach to the medical field--"Precision Medicine," which directly contrasts with the traditional methods of medicine. 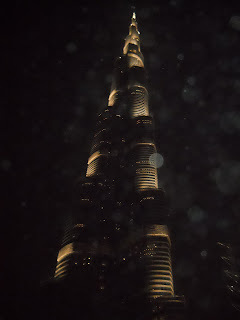 A busy but productive day here in Abu Dhabi. 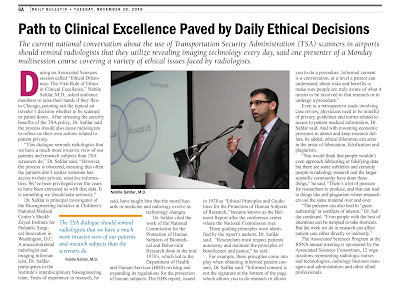 The debate over security screening at U.S. airports has direct relevance for radiologists and their ethical responsibilities to their patients, according to Dr. Nabile Safdar, principal investigator at the Sheikh Zayed Institute for Pediatric Surgical Innovation. Speaking on "Ethical Dilemmas: The Vital Role of Ethics in Clinical Excellence" at the Radiological Society of North America on Nov. 29, Dr. Safdar said, "This dialogue reminds radiologists that we have a much more invasive view of our patients and research subjects than TSA screeners do....We've been privileged to have been entrusted with that data. It is something we should take seriously." Dr. Safdar went on to say, "Informed consent is not the signature at the bottom of the page which allows you to do research or allows you to do a procedure. Informed consent is a conversation, at a level a patient can understand, about risks and benefits to make sure people are truly aware of what it measn to be involved in that research or to undergo a procedure." Click on the image below for the full article from the RSNA Bulletin. Sunday, December 5 is the start of the World Health Care Congress Middle East. The Congress is co-sponsored by the Health Authority and the Tourism Authority of Abu Dhabi. The Congress convenes global thought leaders and key decision-makers from all sectors of health care to share global best practices. Doctors and leadership from Children’s National Medical Center and the Sheikh Zayed Institute for Pediatric Surgical Innovation have joined people from all over the world here at the Congress to exchange ideas for improving health care delivery. All of Sunday’s sessions focused on one word: innovation. Conducted in a discussion format aimed at fostering open dialogue with the audience, the day’s presenters featured colleagues from many countries, including the United Arab Emirates, Australia, Singapore, the United States, Saudi Arabia, and others, who shared the latest innovations in nearly every aspect of health care. Topics ranged from reform of health policy to doctor-staffed call center models designed to care for people by telephone when distance prevents in person treatment, to new methods for tracking and managing chronic diseases like cardiovascular disease. Today’s session began with welcoming remarks from H.E. Eng. Zaid al Siksek, Chief Executive Officer of the Health Authority of Abu Dhabi, who set the stage for the day's theme by noting that effective innovations in health care benefit not just one city or country, but every society around the world. The promise of innovation is a key focus of the Sheikh Zayed Institute and Children’s National. Our doctors will carry this theme through their own panels and presentations on Monday, December 6, adding the unique perspective of pediatrics to the ongoing conversations here in Abu Dhabi. Be sure to check back for updates as the conference progresses.